The Fates (Moirai) were thought to be three women spinning: Clotho who turned the spindle, Lachesis who measured out a length of thread (the length of your life) and Atropos who snipped it off. In Homer's Iliad, we are told that the hero Achilles' fate is to die at Troy (and he knows it) - after a short life filled with glory. The play "King Oedipus" by Sophocles tells how Oedipus' was fated to kill his father and have children with his mother: he tried very very hard not to, but unknowingly he did both things. (see more here). 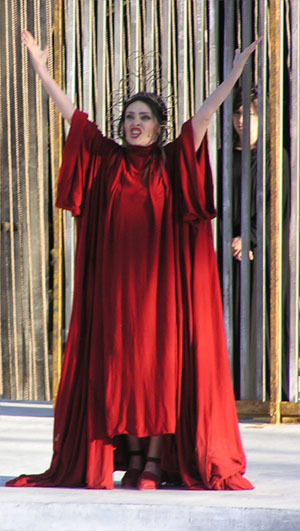 Queen Clytemnestra has just killed her husband Agamemnon, fulfilling the will of the gods (photo AMW). The Greeks (or strictly speaking the Athenians) invented a form of story-telling: they called it tragedy. A 'Greek Tragedy' was a play, performed as part of a competition at a festival each year in Athens in honour of the god Dionysus : the best tragedy won a prize (as did Sophocles' King Oedipus). In nearly every tragedy, the "hero" (or heroine) - however much they fight against it - ends up fulfilling his or her fate: what happens is exactly what the gods had said would happen. The climax of every tragedy is the peripeteia: the turning point where the hero's fortune turns from good to bad. (In some tragedies, things eventually turn out fine for the hero or heroine - but they still get exactly what the gods foretold for them). Very often a tragic hero helps to cause his own downfall - the peripeteia - by committing hybris. Hybris is behaviour which offends the gods - usually when someone starts behaving as if they were a god. The peculiarity of Greek thinking was that they believed BOTH that your fate was inescapable AND that you can commit hybris deliberately. That is, your fate is already decided, and by your life choices, you go along with it. So when it all ends badly, it has been doubly decided - by the gods and by yourself. What's this got to do with Xerxes and the Persians? Herodotus too sees history in "tragic" terms. Every person, every community is subject to Fate. An act of hybris brings about the inevitable downfall. So the anger of the gods, and the punishment which follows, is no surprise. Consider the stories told earlier: for example Croesus and the oracles, Cyrus and Tomyris, Polycrates. 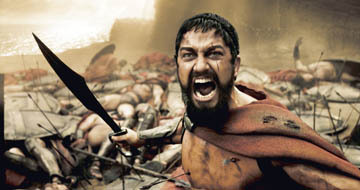 Xerxes seemed to the Greeks a perfect example of hybris in action. Herodotus gives many, many examples of his hybris, proving that the gods are against him, and making it obvious that he is fated to come to a bad end. A scene of carnage from the 2006 film "300"
It's going to be really difficult to work out what Xerxes was really like - and what he actually did, let alone what he was thinking. We only know the Greek side of the story. That's because the Greek stories and images became part of the unquestioned basis of "Western Civilisation". Civilisation that was western, not eastern - because, as they convinced themselves, the glorious west defeated the degenerate east in the great clash of civilisations between 490 and 479 BC. If victory at Marathon (490) made the Greeks cocky, victories against Xerxes (480 and 479) convinced them that it was their Fate to rule the east. And later Greeks, Romans and Europeans have seldom challenged this view. Greek and Persian warriors confront each other. 4th century BC. 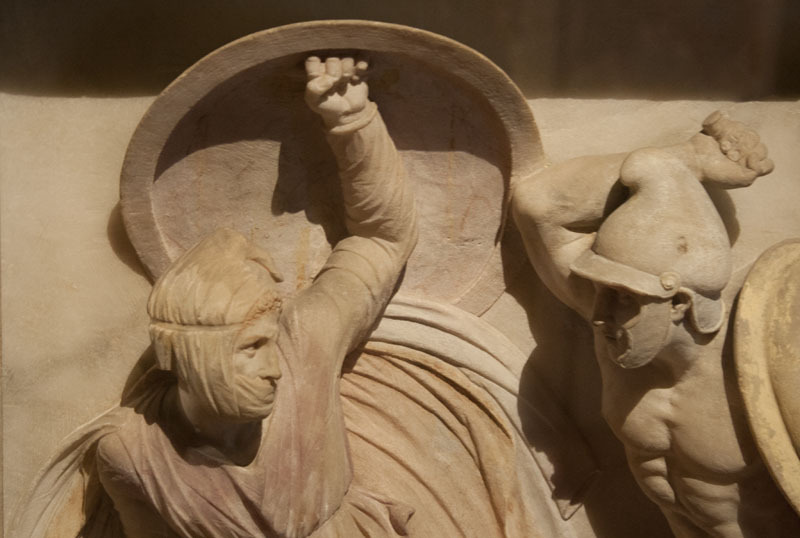 From the Alexander Sarcophagus in Archaeological Museum, Istanbul. Alexander invaded the Persian empire on the pretext of paying back the Persians. 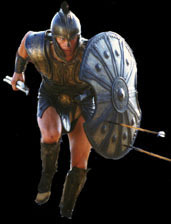 Alexander saw himself as an agent of the gods, punishing the Persians for their hybris in the Greek Wars. Photo AMW. It's essential to grasp the Greek ideas of fate and hybris before getting involved with the story of Xerxes. We have no other source except Herodotus. An Ionian aristocrat (c 550 - 476 BC) who tried to stop Aristagoras from initiating the Ionian Revolt. His writing (fragments only survive) were about his travels around the Mediterranean and Black Seas, and an attempt to rationalise the myths associated with various families. Herodotus quotes him. You can see now the importance of oracles and dreams in Greek story-telling: the only ways you can find out your fate in advance. Oedipus got his bad news from Apollo's oracle at Delphi, which also told Orestes he had to kill his mother. And what about Croesus? You can now see that this is a purely Greek story about oracles and fate - with probably no historical truth whatsoever. Also written hubris- and pronounced hoobris. A well-known TV celebrity's wife was once asked if her husband was religious. "Oh, yes," she said. "He thinks he's god!" This needs a litttle explanation: why on earth would you deliberately offend the gods? Aristotle's analysis of Greek tragedy is well-known (though often misunderstood). He said that the hero/heroine falls from happiness to misery as a result of a mistake (Greek hamartia: not a "flaw" of character as frequently claimed). From the Greek point of view, t was apparent that Xerxes made several "mistakes". An Athenian playwright - he fought at Marathon where his brother was killed. He wrote between 70 and 90 tragedies, and won the prize 13 times. There's an interesting story about his death. It was fated that he would be killed by the fall of a house. He moved into the countryside, well away from all buildings. Alas, an eagle carrying a tortoise (get it?) dropped it from a great height on to his bald head. Not even the great tragedian could avoid his fate. The play is set in the Persian court. Queen Atossa, the queen mother, is anxiously awaiting news of her son's expedition to Greece. A messenger arrives with terrible news - the mighty Persian force has been utterly destroyed. After Darius' ghost appears to explain where his son went wrong, Xerxes himself arrives, dressed in rags. The Persians are still lamenting their fate as the tragedy ends. A famous modern version of The Persians was produced by Peter Sellars in 1993, where the scene was set in Iraq, with Saddam Hussein fulfilling the role of Xerxes. For an essay by Edith Hall on this and more recent productions of the Persians see here. The idea of Europe and Asia as opposites is totally new. Somehow Xerxes' hybris involved building a bridge between the two. The "same race" is because the Greeks believed that the Persians were descended from their hero Perseus (doh!). What was Xerxes really like? An interesting parallel might be with the Scottish king Macbeth (ruled AD 1040 - 1057). Historically he was a good and popular king, with much military success (against the English). But thanks to Shakespeare he's gone down as an example of arrogant tyranny at its worst.